In this study, researchers were able to measure the length of O-H bonds on catalytic surfaces structures, and correlate these bond lengths to the relative acidity of the material. In conventional Nuclear Magnetic Resonance (NMR) technology, researchers can acquire physical and chemical information about materials they are investigating based on the way atomic nuclei in the sample interact with a strong magnetic field. With Ames Laboratory's Dynamic Nuclear Polarization NMR (DNP-NMR) spectrometer, which is uniquely suited to materials chemistry research, microwaves are used to polarize the electrons, which subsequently excite the nuclei of the sample being analyzed. Paired with innovative experimental techniques, what results is a highly sensitive reading of the sample, orders of magnitude faster than traditional NMR methods. "Conventional solid-state NMR can, in principle, elucidate the structure of materials with atomic scale precision. However, NMR's fundamental lack of sensitivity often challenges its applications to surfaces and interfaces, and that's where catalysis actually happens," said Marek Pruski, Ames Laboratory senior scientist and the principal investigator of the research team. "This is where DNP-NMR comes in. With its enhanced signal, it provides a unique analytical tool to determine the seemingly minute differences in materials' structure which often determine their performance." The discovery is part of a larger scope of research, using a difficult-to-measure isotope of oxygen, 17O, to analyze materials with DNP-NMR. "It's the only isotope of oxygen that is measurable by NMR, but unfortunately its natural abundance is prohibitively low," said Frédéric Perras, postdoctoral fellow. "That meant enriching your samples with expensive 17O isotopes—which is sometimes very difficult— was mandatory. DNP-NMR provides a new avenue for doing 17O NMR, without isotope enrichment." "This ability is opening new doors for the catalysis research community," said Igor Slowing, a scientist studying heterogeneous and interfacial catalysis at Ames Laboratory. "If we can see the active sites of catalysts at this level of detail, we can begin to really understand how they work and then improve them. This could have a significant impact on many industries." The research is further discussed in the paper, "Natural Abundance 17O DNP SENS Provides 17O-1H Distances with Sub-Picometer Precision and Insights into Brønsted Acidity," authored by Frédéric Perras, Zhuoran Wang, Pranjali Naik, Igor I. 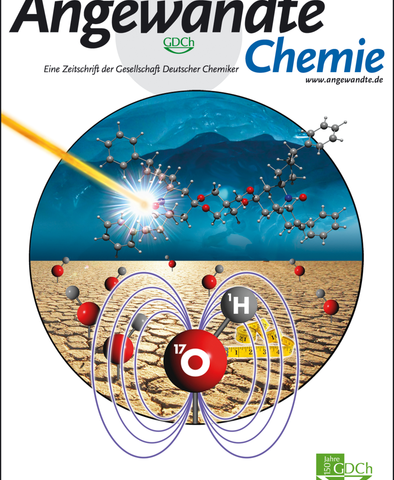 Slowing, and Marek Pruski; and published in Angewandte Chemie.